Tufted Face Weight: 50 oz/yd2 (ASTM D 418). We’re proud to deliver and install turf that saves families and businesses time and money—allowing you to focus on the things that matter most. With our advanced cooling technology we’ve taken on summer-time heat in a smart and easy way. A simple addition to the turf’s infill provides an average cooling range of 30-50 degrees and works naturally when hydrated by irrigation, rainfall and dew. Feet and paws appreciate the difference! No Fault provides all materials, labor, equipment and services required to accomplish related work in accordance with the drawings and specifications. 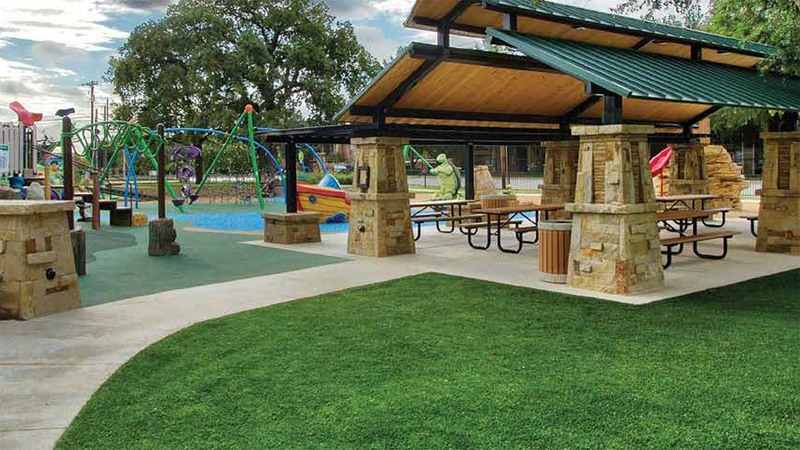 The turf system shall be specifically designed, manufactured and installed for high use, public playgrounds. The turf system shall be IPEMA Certified and 100% wheelchair accessible (ASTM F 1951) in the field. The turf system shall drain up to 130 inches per hour (ASTM F 1551), excluding the crushed stone base. The system’s shock attenuation shall have a G-max value of less than 200 and a Head Injury Criteria (HIC) less than 1,000 (ASTM F 1292). 1. Synthetic turf consisting of nominal one and a half inch (1.5”) long polyethylene fibers with thatch that is tufted into a single, dimensionally stable, three component primary backing with a secondary backing consisting of a minimum of 17 ounces of urethane per square yard. 2. Closed cell foam underlayment pads that meet or exceed the standard specification for impact attenuation of surfacing materials within the use zone of playground equipment (ASTM F 1292). 3. Synthetic Turf Infill that is designed to cool the playing surface 30-50 degrees as well as prolong the life of the turf fibers shall be used. A combination of two (2) pounds of sand and one (1) pound of clean silica per square foot shall be mixed and installed via power broom in at the job site. Our work includes grading necessary to shape and drain the area and base preparation and installation of the synthetic turf in areas shown on Drawings.